I enjoyed attending this intense day recently, which comprised ten compact presentations with round-table discussions, including international perspectives of participants from universities in Australia and France, and the global WorldSkills initiative. Diverse theoretical frameworks of andragogy and associated contemporary issues were explored prioritising conceptualising knowledge and experience in vocational practice. Policy and institutional critiques discussed functionality and complex skill development. Overall tensions included those between vocational and academic; broad and transferable versus situated curricula; judgments of social value and flexibility; and developing professionalism. The SIG have run a number of events in the last year or two and I wish I could make it to Belfast at the end of the month! We also have the RaPAL Joint Conference on 22nd October in London to look forward to. A theme running through is defining forms of specialist knowledge, whether vocational, professional, English, maths or science, and the associated teaching and learning and institutional frameworks of delivery. Anna Mazenod, Université Paris-Dauphine (currently undertaking studies at the UCL Institute of Education) presented Vocationalism and Academic Drift – the conflict at the heart of apprenticeship policy which is based on comparative case study across policy and provision in England, Finland and France. She identifies tensions in England between policy and practice; and between vocationalism, or the emphasis on preparation for work in a given ambit, and academic drift, the bias of an overwhelmingly academic education system to fundamentally structurally undermine other forms of education and training. 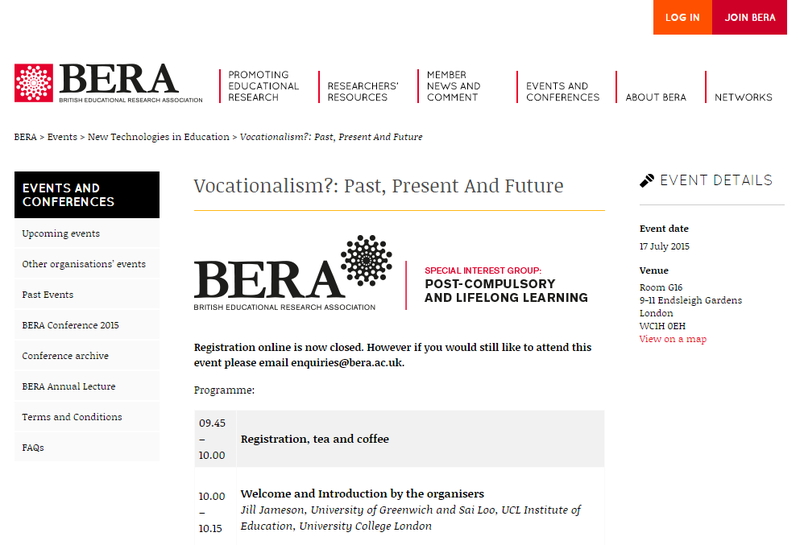 This debate around the nature of knowledge and practice in vocational education and associated educational andragogy and curricula is a major current theme of the BERA SIG, and Mazenod describes a policy environment which is not developed to meet its own stated objectives. Mazenod suggests a need to improve the standing of apprenticeships in England, and to recognise their adult nature and need for underpinning skills and knowledge which are not likely to be held by NEETs (not in employment, education or training). As such, she argues that apprenticeships are not an appropriate vehicle to resolve social issues around youth employment, education and training, where an emphasis on broader vocational learning may be more appropriate. Mazenod queries curricula of vocational competence which delineate completion of tasks to specification and overlook ‘professionalism’. She suggests that learners who participate in workplace learning develop aspects of professionalism, posited as benefits of situated learning in communities of practice (Lave and Wenger, 1991). This ‘professionalism’ perhaps relates to decision-making capabilities and applications and other forms of interaction and applied context or discipline specific knowledge which may not be overtly expressed or described. Elements of this debate were studied by an international team analysing WorldSkills participants and focussing on generic characteristics and perceptions (Nokelainen et al, 2012) where selection of winners is based on broader criteria than excellence to ever more detailed and inaccessible technical specifications. Norman Crowther, Association of Teachers and Lecturers and Norman Lucas, UCL Institute of Education, followed on with Understanding the FE Sector as a Strategic Action Field and argue similarly to Mazenod with apprenticeships that neoliberal policy frameworks are not meeting their own objectives for Vocational Edcuation and Training (VET) within the Further Education (FE) environment. They develop a model of ‘strategic action fields’ where incorporation of colleges in 1992 left undefined significant core features, or ‘unorganised social space’ critical to implementation in its rush for quasi-market creation. We witness a sector which has suffered recent cuts of 25% and a further 25% ongoing as it flounders in combining its roles of self-management, direct employer engagement and social service to local and regional needs; while being central government regulated and funded. Crowther and Lucas argue that the logic of incorporation stands in the way of it reaching stability in these critical unorganised social spaces requiring stakeholder negotiations and settlement in respect of teaching and learning, curricula and professionalism and their strategic role in provision. Paramount are industrial relations which recognise the requirement for complex high skill professionalism where groupings of variable performance and contextual set-up currently exist across the sector. Crowther and Lucas conclude that the implied pre-requisites of educational and vocational focus and innovation are not provided for by incorporation’s policy drivers of autonomy of college interest, financial efficiency and quantitatively understood outcomes. Erica Smith, Federation University Australia, interrogates apparent value-judgments in funding hegemony in When is a job considered an ‘occupation’ and what effect do these assumptions have on training? as established apprenticeships’ funding and provision is extended out to ‘traineeships’ in new ‘valued’ ambits while other forms of, particularly service sector, VET are undercut as their socially constructed value and skills levels assessments fall short. Augmenting the range of provision has met with challenges in developing curricula and schema of underpinning knowledge and the quality of private training providers, which in turn has impacted upon the prestige of the new traineeships. Established conceptions of occupation, occupational skills and occupational identity found in apprenticeships influence an identification with the trade or craft, and often male-centred prioritisation; while the less established traineeships were more likely to identify with an employer or industry, to be non-unionised, and female. Smith suggests that organised resistance to the traineeships, by unionised apprenticed occupations, led to their funding being progressively undermined in successive budgets without democratic debate and associated oversight by the agencies which had put together the policies and funding frameworks to introduce them. Funding reduced under the guise of directed and prioritised subsidies which differentially resourced across traineeships and had an impact of reducing participation by minority and marginalised groups. Furthermore, the overall reduction in VET participation correlates with an increase in youth unemployment. Sonal Nakar, Griffith University, Australia was unable to join us with ‘Reasonable adjustment’: Is it a way forward to manage diversity and equity issues in Vocational Education and Training? The paper discusses how social equity influences on supported participation in VET have progressed to market-driven strategies increasing participation in global educational provision. Nakar draws attention to the blooming market in international educational participation which in tertiary education is predicted to rise from three to eight million studying outside their home country by 2025, Australian VET enrolments at 35.6% annual growth, and with $17billion of exports overall. Nakar argues that inattentive policy shifts, such as in visa regulations, and economic flexibility requirements impact negatively on learners’ participation leading to choices to study elsewhere. These pressures combined with reasonable adjustment obligations have inspired innovation in flexible teaching and learning delivery by private providers; however questions have arisen with regulators whether this flexibility is impacting on the quality of skills and attribute development in learners, particularly in fast-track courses. Ultimately, it may be found that reasonable adjustment for any given profile of learner is not being responded to adequately in the generic teaching and learning flexibilities developed to increase global participation and provision. Jim Hordern, School of Education Bath Spa University, presented on Differentiating vocational knowledge elucidating the importance of coherent underpinning theoretical knowledge frameworks from ‘pure disciplines’ being appropriately recontextualised to the detail of vocational practice and applied problem solving across scenarios thereby reconstituting both applied knowledge and practices as a specialist field; and vice versa. Prioritising which disciplinary knowledge and the extent to which it retains its structural meaning as it is recontextualised across vocational applications is a matter for agreement between stakeholders. Hordern emphasises the importance of the existence and development of such specialist knowledge and practices in dialogue with theoretical disciplines, arguing that this constitutes vocational expertise and standard-bearing communities of practice which adapt to change, respond to industry challenges, and contribute to a self-improving system. Equally, the importance of other situated knowledge and practices gained from immersion in terms of norms and interactions contribute to the functioning and coherence of the vocation. In debating vocational curricula, Hordern notes the potential for conflict between underpinning theories, applied knowledge and practices, other generic capabilities, and legislative and policy compliance where an imbalance in favour of any area would result in dysfunctionality to purpose in the state. Matt O’Leary and Rob Smith, University of Wolverhampton, presented Vocational pedagogy, policy anxiety, discourse & practitioners utilising Bernstein’s (2000) concepts of vertical and horizontal knowledge to investigate pedagogy in FE institutions. Reporting on participatory research with eighteen ‘expert’ practitioners from eight colleges, O’Leary and Smith found reflective practice served the purpose of generating applied horizontal knowledge from vertical specialist knowledge frameworks in the context of teachers’ situated learning. Three particular issues were identified in practice which positioned practitioners in direct conflict with institutional management: around the struggle to teach specialist English and maths curricula, in emphasising the role of holistic ‘care’ of learners as essential to provision, and the pressures of ‘dataveillance’ which ate in to time for preparing and engaging in teaching and learning practice. O’Leary and Smith conclude that institutional policies and activity foreground low pedagogical value institutional horizontal knowledge and practices; undermining and eating away at high value vertical theoretical frameworks and professional teaching practice. Janet Hobley, Oxford Brookes University, presented Vocational pedagogies: The science of teaching or the teaching of science? analysing the implications of integrating subject specialist pedagogies such as science and maths within VET and the conflict between quality theoretical underpinning knowledge whose meaning structures recontextualise across a vocation’s applications, and task-based approaches which unitise theoretical application and focus on skill. She draws attention to research discussing exam boards’ sustained move away from the former towards the latter; rather than targeted teaching and learning innovation; while contrasting posited motivational versus demotivational characteristics of learning and curricula for diverse learner cohorts. In particular she highlights teachers’ capacity to recontextualise “facing both ways” (Barnett, 2006) between vertical and horizonal knowledge. Hobley argues against a separation of academic knowledge specialisation from vocational practice specialisation; and for more effective selection and recontexualisation of the vertical forms of scientific theoretical knowledge within vocation specific pedagogy such that learners draw on and utilise transferring explicit meaning structures across problem-solving in their practice. Tara Furlong, Designing Futures (currently undertaking studies at the UCL Institute of Education), followed on with Client Care and Professional Communication: implications for vocational and professional adult education reporting on a study which utilises Systemic Functional Linguistics and discourse analysis of initial professional client communications in the legal domain to generate curricula in professional and vocational communication. She argues that the features of written communication negotiating the early stages of client professional relationships and the matters to be resolved extrapolate out across professions and into the vocations. These integrate the framing of a client in reference to pertinent features of a situation, assessment of risk, agency and action and the relationship established between client and professional. The analysis produces genre and register findings of seven social stages of a client communication, and includes functional content and associated language features which provide exceptional client care. These pedagogical meta-findings support the development of ‘discursive competence’ as a component of ‘professional expertise’. Tony Leach, York St John University, presented Vocationalism in the 21st Century: graduates’ experiences of employment and career enactment in a neoliberal environment illustrating the construction of neoliberal employment markets and protean models of human transferable knowledge, skills and abilities packages; and the role for VET. Leach explores a range of post-graduation narratives which delineate the increased self-confidence, -knowledge and -opportunities of learners in their working environments, the impact of policy and funding cuts, and their navigation of uncertain career paths and future potentialities. Dr Sally Messenger, Director, WorldSkills UK Legacy Projects, sadly missing Jenny Shackleton, Assessment Adviser, WorldSkills International and WorldSkills Europe, concluded the day with Global Vocational Standards and Assessment for Excellence discussing the value of research-underpinned international WorldSkills competitions to developing and driving improvement in international standards and best practices in vocational excellence. WorldSkills commissions experts in each field, liaising with business, industry and governments and creating Test Projects constructed to provide evidence across parameters endorsed by industry and including engagement with global bodies such as the OECD, UNESCO and the ILO. A recent study ‘Modelling Vocational Excellence (MoVE)’ (Nokelainen et al, 2012) was a collaboration by researchers from Australia (RMIT University), Finland (University of Tampere), and the UK (University of Oxford) analysing Squad UK 2011 in London. Beyond technical specifications, communication, innovation, creativity, problem-solving and work organisation/self-management are found to be critical to competitive performance with motivational commitment factors, and belief in themselves, rating highest. In developmental environments, ‘expansiveness’ was found to be key. Further studies are in process. There are implications for the investment in technical and professional development of teachers and curricula in VET. ← Ra ra! Go Functional Skills! Thanks Tara – there are some really interesting ideas here and I appreciate you taking time out to share them with us all.